Bounce Milwaukee is an active supporter of non-profit organizations in our city. Both of the owners have an extensive history working in education and the non-profit sector, and know how important fundraising can be. We'd like to support your organization, too. We can provide you with discounted tickets which you can then sell to your supporters (or give to major donors), you can pre-sell tickets to a specific night, or even rent the entire facility. We can provide customized events, accommodations for meetings, announcements and large group activities. And these options are scalable: you can start with as few as 20 tickets and add more tickets (and space) as you need them. And once your friends and supporters hear how much fun they can have while supporting your mission, you'll likely need a lot more. We have a wide array of food and beverage options available, from our standard menu items available for guests to purchase themselves to buffet-style dining, to catered, full-service meals with a fully-stocked bar. Did we mention that it's fun, too? Leave the details to us, and see what happens when you're able to relax and enjoy a wide range of activities alongside your supporters and donors. 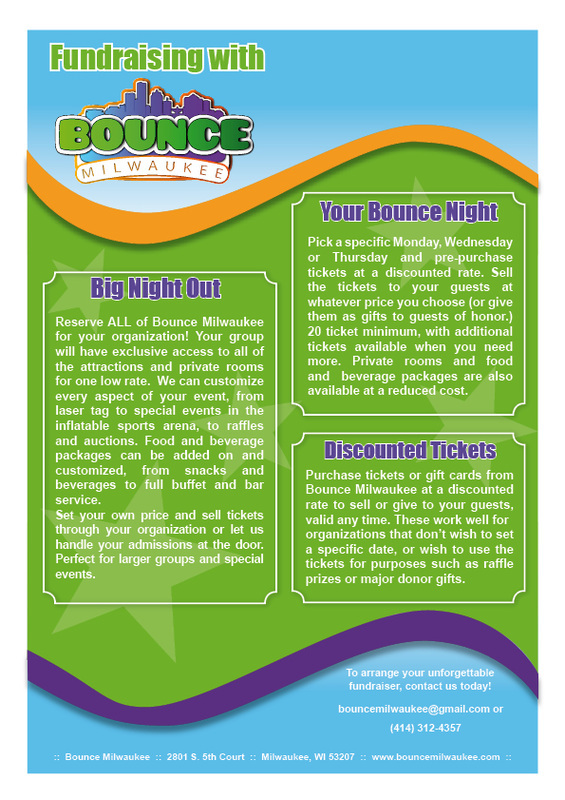 Use the form below to give us some details to start with, email us at bouncemilwaukee@gmail.com or give us a call at (414) 312-4357. Let us know as much as you know, even if you just have ideas at this point. We'll contact you to work with you to make your fundraiser a success.